Yoyo Casino is an online casino launched in 2017, licensed in Curacao, owned and operated by Araxio Development N.V Casinos. Their website is simply designed with a colour combination of peach and white, colourful graphics, and convenient navigation, fully-optimised for mobile devices and instant play. 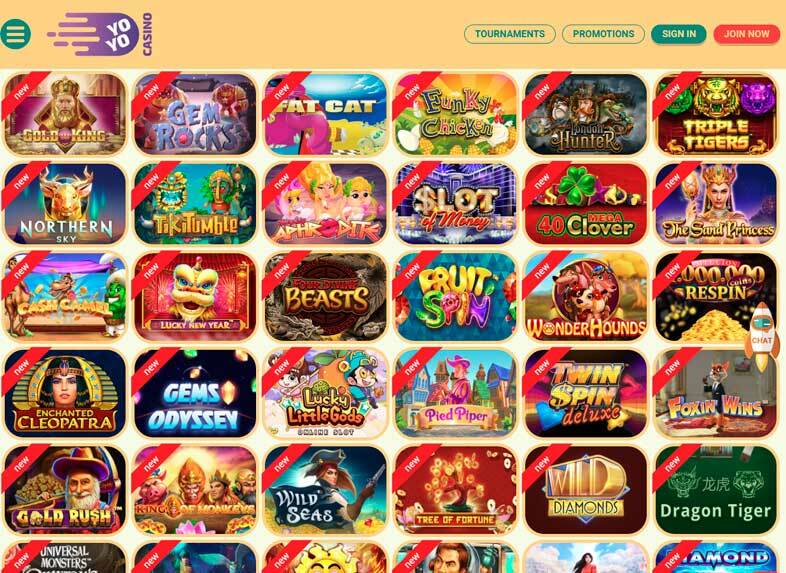 At Yoyo Casino, you can experience an unforgettable realm of excitement, with an assortment of licensed games from reputable software companies such as Microgaming, Amatic, Pragmatic play, NetEnt, iSoftBet, Yggdrasil, ELK, Quickspin, and many more. Yoyo Casino has a top priority of creating comfortable and safe games for its users. This Casino offers quite some games that even casual guests will find them suitable for their needs. Some of the most popular games are Forbidden Throne Slot, Hidden Valley Slot, Taco Brothers Slot, the Dragon Sisters Slot, and many more. There are also varieties of table games available, which a player can choose from different variants of Blackjack, Roulette, Baccarat to poker games. The table games include Royale Blackjack, American Roulette, Carribean Stud Poker, and All American Double up. There are also different variants of video poker games available such as Deuces and Joker, Deuces Wild, Jacks or Better, and others. Most of the featured games are Slots, and you can select from different varieties provided including Star Fall and Big Bad Wolf. More slots are also available in the form of progressive jackpot games, and games played on Yoyo Casino are selected by some software professionals. There are a total of 62 table games, 1188 slots, 18 video poker, 9 live casinos, and 86 jackpots available on Yoyo Casino. By playing in this Casino, you are sure of extreme fun from the game, with guaranteed jackpots and big winnings, which will bring about many positive emotions. Several countries are restricted from using Yoyo casino, you can log into their website to check a list of these countries. Languages supported by this online casino include English, Polish, Portuguese, and Russian. Our yoyo Casino’s exclusive welcome Bonus package gives a 150% bonus up to €500, with 200 free spins, and the minimum deposit amount for this bonus is €20. A standard structure is used to lock the full balance of the welcome bonus from the moment the deposit is made until the wagering requirements are met. The wagering requirement at Yoyo Casino is 30× the initial deposit and the received bonus, but all the games have a different percentage for wagering requirements. The free spins given to players for their first deposits are spread out for 10 days with 20 free spins daily, which gives 200 free spins. The first 20 free spins are added immediately after your deposit is confirmed, while subsequent ones come in every 24-hours throughout the remaining 9 days. The maximum bet allowed on a single round of play is €5, and the deposit bonus has no maximum win, although the free spins have a maximum win of €80. Note that, you can always cash out this bonus at any time. In addition to this, you can get up to €3,000 every week, by playing your favourite games daily. Also, you can get 50 instant extra spins on various games, to start the week with a good mood for big winnings. Yoyo Casino gives weekend reload bonus to its players every week, and it consists of a unique 50% bonus with 50 free spins. Loyalty points are also awarded and can be converted to bonuses with a reduced wager. A 10% cash back bonus can also be gotten from the Live casino when you play your favourite games every day. You can get up to €150 as cash back every week. If you like to get a higher bonus you can choose a 200% bonus online casino from our special section. Grab them and enjoy your favourite games more. In case you want to try YoYo casino for free, you can use our no deposit promo code: CBJ and receive 25 free spins on Beowulf slot. It easy to claim your free spins, just register now and enter your promo code. In case your spins are not activated automatically, just contact online support chat. Yoyo Casino is a mobile-friendly online casino, fully optimized for mobile devices. Players can easily choose and play slot or other casino games on their mobile phones at any time or anywhere, with just a few simple taps. All the games can be enjoyed both in instant play and on mobile devices. Players can also make deposits or Contact Customer Support. The standard verification attached to the first withdrawal is that you must confirm your identity before you are able to make your first withdrawal. Yoyo Casino has a fast payout and different payment methods. Deposits can be made through E-wallets which are instantly credited to your account, or you can make the deposit with a Credit/Debit card, but deposits made through Credit/Debit cards take up to 3 days to be processed. The banking options available include Neteller, Bank transfer, Credit/Debit cards, Paysafecard, Skrill, MultiBanco, Boleto, Klarna, and QIWI, with a withdrawal limit of €10,000 per month. It takes approximately 24-hours to process a withdrawal on this casino, and they do not process withdrawals on the weekend. Yoyo Casino players with a casino, account-related, and general issues can contact the Customer-friendly Support team through live chat, phone, and email, available for 24-hours daily. This casino also has a well-informative FAQ section, which can provide answers to most of your questions. Every information exchanged including the games offered by Yoyo Casino, is protected through a Secure Network using the industry standard 128-bit SSL (Secure Socket Layer) Internet Connection Protocol, which is used for secure money transactions. This protocol guarantees the security of personal data by encrypting data transmitted on the internet. Since it is the laws of Curacao that regulates the Yoyo Casino, players can be rest assured that, they will be treated by the standard rules and regulations, and they will have fair gameplay. Yoyo Casino offers exciting games to be played in demo mode as well as for real money. To play for real money, you need to register an account and make a deposit. Click on the link in the email sent to the email address you provided during registration to verify your account. After verifying your account, you can now make a deposit to enjoy the mouth-watery welcome bonus package. Enter the deposit amount and click on the “Deposit” button. After your payment is confirmed, the amount deposited will instantly be credited to your account. Yoyo Casino is a newly established online casino that offers a great experience and a fascinating world of excitement to their players, with the best-licensed games from the world’s renowned software manufacturers in the gambling industry. You cannot be tempted not to sign up with them, because the exciting games, free spins, and the numerous bonus packages they offer are overwhelming.